Chateau Valencay tapestry shows a chateau in the Valencay commune of France. This castle was called by George Sand, the lover of Frederic Chopin, as the "one of the most beautiful on earth". Here we see the chateau in its French Renaissance style, and its luxurious grounds and gardens o over 40 hectares which was much admired in its time. The castle was built in 1540 overlooking the Nahon river by the d'Estampes family and was finally completed over 200 years later. The round tower in the Western corner of the castle is constructed with a 'dome a l'imperiale' and elements reflecting the style of Chambord Castle. The interior has over 100 rooms which were some of the most advanced for its time. 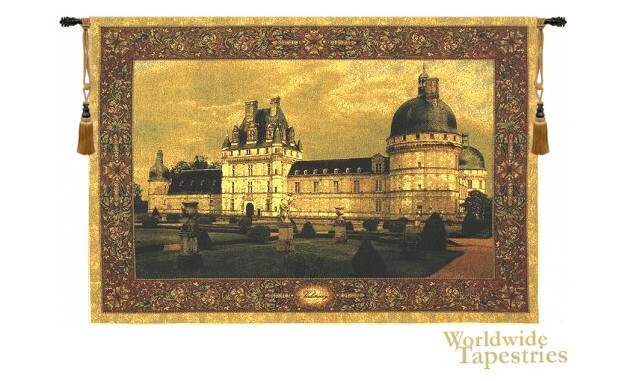 This castle "Chateau Valencay" tapestry is unlined and has a tunnel for easy hanging. Note: tapestry rod, tassels, and accessories, where pictured, are not included in the price.